PT Bank Negara Indonesia (Persero) Tbk - BNI (IDX:BBNI) or know as "Bank BNI" a is a well-known state-owned financial services institution in Indonesia. Bank BNI conducting business in the field of commercial banking industry and offers a full range of general banking products and services. Its products and services include personal banking, priority banking, business banking, international banking and treasury. Bank BNI is a state-owned bank and is controlled by the Government of Indonesia. As today, the Government of Indonesia holds 60% ownership of Bank BNI’s shares. Other 40% remaining shares in Bank BNI was owned by general public and investors (8.3% domestic and 31.7% foreign). 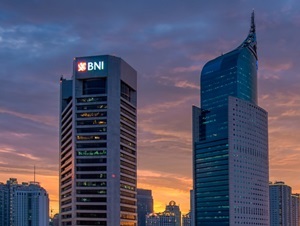 Based in Jakarta, Bank BNI offers services through 17 regional offices, 200 domestic branch offices, 6 foreign office networks, 1,085 sub branch offices, 595 cash offices, 17,966 ATMs throughout Indonesia (as of December 2017). According to PT Bank Negara Indonesia (Persero) Tbk Annual Report 2017 as cited by JobsCDC.com, Bank BNI is running well in the business year of 2017 (ended in 31 December 2017). Bank BNI managed to record total profit of Rp13.77 trillion in 2017. This number is up 20.68% from Rp11.41 trillion in the same period previous year. Total assets grew by 17.62% from the previous year, from Rp603.03 trillion to Rp709.33 trillion in 2017. Good looking with minimum height of 167 cm for Male and 157 cm for Female. Single/not married and willing to not get married during the internship program. SMA or equivalent : minimum average student report cards in the 5th and 6th semester of 7.00. D1 - S1 : minimum GPA of 2.50. Never get into drugs or other law violations (accompanied by a SKCK). Media social accounts (FB, twitter, Instagram and Path) listed on your CV. JobsCDC.com now available on android device. Download now on Google Play here. Please be aware of recruitment fraud. The entire stage of this selection process is free of charge. 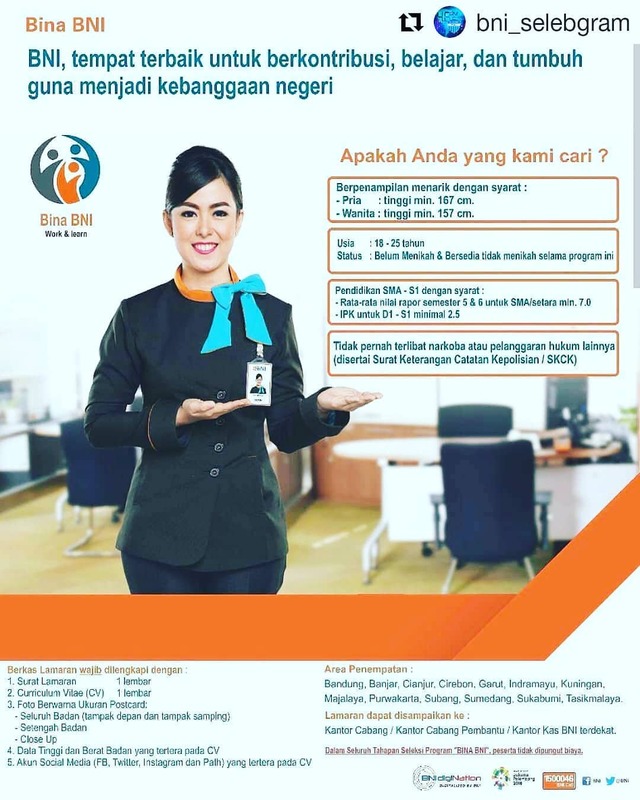 PT Bank Negara Indonesia (Persero) Tbk - BINA BNI Internship Program BNI April 2018 will never ask for fees or upfront payments for any purposes during the recruitment process such as transportation and accommodation.